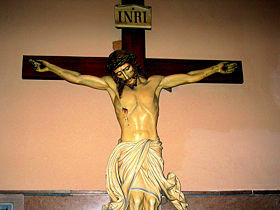 The crucified Jesus with the initials INRI above him. INRI is an acronym of the Latin phrase IESVS·NAZARENVS·REX·IVDÆORVM (Jesus Nazarenus, rex Judæorum), which translates into English as "Jesus Nazarene, King of the Jews." This title appears in the New Testament in the Passion narrative of the Gospel of John (19:19). During Jesus' crucifixion, a Titulus Crucis (Latin for "Title of the Cross") was inscribed in wood and placed above Jesus head. In the context of the Crucifixion, the titulus IESVS NAZARENVS REX IVDAEORVM (and its translation), written in three languages (Hebrew, Latin, and Greek), was affixed to the cross. Within Western Christianity, many crucifixes and other depictions of the crucifixion include a stylized plaque or parchment, called a titulus (title), bearing the Latin letters INRI, occasionally carved directly into the cross, and usually just above the head of Jesus. A Christogram is a monogram or combination of letters which forms an abbreviation for the name of Jesus Christ, and is traditionally used as a Christian symbol. Different types of Christograms are associated with the various traditions of Christianity. A monogram is a motif made by overlapping or combining two or more letters or other graphemes to form one symbol. According to the biblical accounts of Jesus' death and crucifixion, it is said that Jesus was captured in Jerusalem and brought to Pontius Pilate to be questioned for the alleged crime of treason/sedition to the Roman Empire. However, when Pilate asked Jesus if he was indeed the alleged "King of the Jews," it is notable that Jesus neither confirmed nor denied this claim, simply replying that he was thus being called so. Jesus' ambivalence on this point was taken as implicit acquiescence of the charge and thus gave Pilate grounds to condemn Jesus as a potential threat to Roman governance as well as a disturbance of the peace. Yet, the bible also records that Pilate found no ill in Jesus and did not wish to crucify him; however, to appease the crowd's demands, Jesus was condemned to die by crucifixion. As the Roman soldiers nailed Jesus on the cross, they mocked him and placed a signpost on the cross that said "Jesus of King of the Jews." This title was appended to the cross to tease Jesus and to ridicule his followers' belief that he was the messiah who would lead the Jews in overthrowing Roman rule. In Latin, the abbreviation of this phrase is INRI. In the Gospel of John (19:19-20) the inscription is explained: "And Pilate wrote a title, and put it on the cross. And the writing was, JESUS OF NAZARETH THE KING OF THE JEWS. This title then read many of the Jews: for the place where Jesus was crucified was nigh to the city: and it was written in Hebrew, and Greek, and Latin" (King James Version). Each of the other accounts for Jesus's death have a slightly different sign: Matthew (27:37) "This is Jesus the King of the Jews"; Mark (15:26) "The King of the Jews"; and Luke (KJV) "This is the King of the Jews." The title was written in Hebrew and Greek and Latin. Throughout history, a number of symbols have been used in Christianity to represent aspects of the life and teachings of Jesus Christ as well as the Christian Church. In the early years of the growth of the church, it was dangerous for Christians to practice their faith in public because they were persecuted by the Roman Empire. As a result, certain symbols arose to secretly convey the teachings of Jesus without raising the notice of Roman authorities. Among these symbols were the so-called nomina sacra (meaning "sacred names"), which were abbreviations of divine names/titles used in early Greek scripture. Terms of reverence for Christ such as Lord, Son, Spirit, Savior, and so on, were written with overlines to indicate their special importance for the early Christians. Starting in the third century the nomina sacra were sometimes shortened by contraction in Christian inscriptions, resulting in sequences of Greek letters such as IH (iota-eta), IC (iota-sigma), or IHC (iota-eta-sigma) for Jesus (Greek Iēsous), and XC (chi-sigma), XP (chi-ro), and XPC (chi-rho-sigma) for Christ (Greek Christos). Here "C" represents the medieval "lunate" form of Greek sigma; sigma could also be transcribed into the Latin alphabet by sound, giving IHS and XPS. One of the oldest Christian symbols is the Chi-Rho or Labarum. It consists of the superimposed Greek letters Chi Χ; and Rho Ρ, which are the first two letters of christ in Greek. Technically, the word labarum is Latin for a standard with a little flag hanging on it, used in the army. A Christogram was added to the flag as an image of the Greek letters Chi Rho, in the late Roman period. In the Latin-speaking Christianity of medieval Western Europe (and so among Catholics and many Protestants today), the most common Christogram is "IHS" or "IHC," derived from the first three letters of the Greek name of Jesus, iota-eta-sigma or ΙΗΣ. Here the Greek letter eta was transliterated as the letter H in the Latin-speaking West (Greek eta and Latin-alphabet H had the same visual appearance and shared a common historical origin), while the Greek letter sigma was either transliterated as the Latin letter C (due to the visually-similar form of the lunate sigma), or as Latin S (since these letters of the two alphabets wrote the same sound). Because the Latin-alphabet letters I and J were not systematically distinguished until the seventeenth century, "JHS" and "JHC" are equivalent to "IHS" and "IHC." "IHS" is sometimes interpreted as meaning Iesus Hominum Salvator ("Jesus, Savior of men," in Latin), or connected with In Hoc Signo. Some uses have even been created for the English language, where "IHS" is interpreted as an abbreviation of "I Have Suffered" or "In His Service." Such interpretations are known as backronyms. Its use in the West originated with St. Bernardine of Siena, a 13th Century priest who popularized the use of the three letters on the background of a blazing sun to displace both popular pagan symbols and seals of political factions like the Guelphs and Ghibellines in public spaces. Many Eastern Orthodox Churches use the Greek letters INBI based on the Greek version of the inscription, Ἰησοῦς ὁ Ναζωραῖος ὁ Bασιλεὺς τῶν Ἰουδαίων. Some representations change the title to "ΙΝΒΚ" ὁ Bασιλεὺς τοῦ κόσμου ("The King of the World"), or "ΙΝΒΔ" ὁ Bασιλεὺς τῆς Δόξης ("The King of Glory"), not implying that this was really what was written, but reflecting the tradition that icons depict the spiritual reality rather than the physical reality. Some other Orthodox Churches (such as the Romanian Orthodox Church) use the Latin version INRI. The Russian Orthodox Church uses ІНЦІ (the Church Slavonic equivalent of INBI) or the abbreviation Цръ Слвы ("King of Glory"). In Hebrew, the phrase is commonly rendered ישוע הנצרי ומלך היהודים (Yeshua` HaNotsri U'Melech HaYehudim IPA: [jeːʃuːɑʕ hɑnːɑtseri meleχ hɑjːəhuðiːm]), which translates instead to "Jesus the Nazarite and King of the Jews." This version was most probably chosen in order that the acronym constitute the tetragrammaton (יהוה) name corresponding with Yahweh or Jehovah. It is possible that the titulus was written in Aramaic, the local vernacular, rather than Hebrew. Dilasser, Maurice. The Symbols of the Church. Collegeville, MN: Liturgical Press, 1999. ISBN 081462538x. Grabar, Andre. Christian Iconography: A Study of its Origins. Princeton University Press, 1981. ISBN 978-0691018300. Hurtado, L.W. The Earliest Christian Artifacts: Manuscripts and Christian Origins. Cambridge, 2006. ISBN 978-0802828958. Karlin-Hayter, Patricia. Oxford History of Byzantium. Oxford University Press, 2002. ISBN 9780198140986. Paap, A.H.R.E. Nomina Sacra in the Greek Papyri of the First Five Centuries. Papyrologica Lugduno-Batava VIII Leiden, 1959. Sill, Gertrude Grace. A Handbook of Symbols in Christian Art. Touchstone, 1996. ISBN 978-0684826837. Steffler, Alva William. Symbols of the Christian Faith. Wm. B. Eerdmans Publishing Company, 2002. ISBN 978-0802846761. This page was last modified on 25 February 2009, at 00:24.